5:30 - 9:30 a.m. and Noon - 6:00 p.m. Pick up your badge and conference materials here. If you didn't sign up for the Thursday tours, Saturday evening party or Sunday breakfast at Flint Institute of Arts, there might still be room. Check with registration and sign up there. Sign up here for Friday beat dinners and Saturday mini-tours. Read up on Board candidates, find information about SEJ Award winners, membership and services. Advance registration is required for all Thursday tours. Attendance on each tour is strictly limited, so registering early is important. Departure times vary (see below), but all Thursday tours will return to the Riverfront Conference Center about 5:00 p.m. For those looking for some exercise, tours 1, 5 and 9 are your best options. Other tours involve moderate exercise. Tours 2 and 7 are best suited for those with limited mobility. Departure: For detailed departure information, please consult your Shuttle Flyer or logistics on your Whova app. Each tour will depart from the Riverfront Conference Center at the times listed below, but will pick up attendees at their hotels earlier. 1. The Last Good Country: Lush Forests and "Holy Waters"
Photo courtesy of Michigan Department of Natural Resources. Click to enlarge. "It's great northern air. Absolutely the best trout fishing in the country. No exaggeration. Fine country." Ernest Hemingway was describing the woodlands and waterways near the tip of Michigan's mitten, the setting for some of his short fiction. The Pigeon River State Forest retains something of the beauty and wildness that inspired the budding author, despite logging that scarred the landscape. A century later, a restored elk herd is a symbol of the forest's renewal. We'll take a post-dawn hike in search of the bugling beasts. We'll learn of efforts to combat diseases that threaten Michigan's deer and hear the remarkable story of the Kirtland's warbler, a songbird rescued from near-extinction. Resource managers will discuss the challenge of satisfying the forest's varied recreationists. Another destination is a fish hatchery that has turned the Au Sable River, revered by anglers as "holy waters," into a battleground over private aquaculture. Total drive time – 6 hours. Coverage. Western Lake Erie and its mammoth Maumee River watershed are Ground Zero for Great Lakes research — by far the warmest, shallowest and most dynamic part of the world's biggest lake system. There's a unique convergence of human and wildlife impacts, such as shipping, automobile manufacturing, tourism, fishing, birding and big agriculture. This region is a major driver for anything from sewage regulations to climate change policies, as well as research into ag runoff, atmospheric fallout from coal-fired power plants, PCBs, toxic algae and invasive species. It's the Great Lakes region's biggest area for fish spawning, as well as a birder's paradise. We'll ply the shoreline for hours aboard a large vessel out of Toledo and hear from leading experts. Total drive time – 3.5 hours. Coverage. Jennifer Carter-Cornell, Funding Practice Leader, Hull & Associates, Inc.
3. Canada's Chemical Valley: From Toxic to Green? Canadians struck oil in 1858, near Sarnia, Ontario, and have excelled in petrochemicals and refining ever since. Sarnia, and the Chemical Valley, has one of Canada’s densest concentrations of petrochemical operations and infrastructure. The flip side of this prosperity is the cumulative effect of emissions from multiple toxic pollutants. We’ll hear about health impacts on a tour with members of the Aamjiwnaang First Nation and then from a panel of health experts, a local Member of Parliament who once worked as an engineer for Suncor and Dow Chemical, the Environmental Commissioner of Ontario and other legal experts well versed in the regulation of emissions. Stakeholders have failed to fund an authoritative health study for a decade. Later in the afternoon we will get an introduction to the small, but rapidly emerging, green chemistry industry in discussions with Bioindustrial Innovation Canada and an on-site tour of a bio-chemical refinery. Total drive time – 4 hours including an international border crossing (read requirements here). Coverage. "In Sarnia's Chemical Valley, is 'toxic soup' making people sick?" The Toronto Star, October 14, 2017. 4. The Shape of Water... and Milk and Beer! Participants learn of innovative solutions to the environmental challenges of producing clean water and milk and beer. See a Michigan State University experimental farm turn manure into electricity and compost that exports phosphorous from sensitive watersheds. Then it's on to the challenges of urban stormwater in Grand Rapids with a tour that includes lunch and beverages at Founders, the largest craft brewery in Michigan, which has partnered with the city in a unique solution to handling its waste. Then we visit the countryside where SwissLane Farms shows how a dairy with 2,200 cows is a national leader in sustainability. Total drive time – 3.5 hours. Coverage. 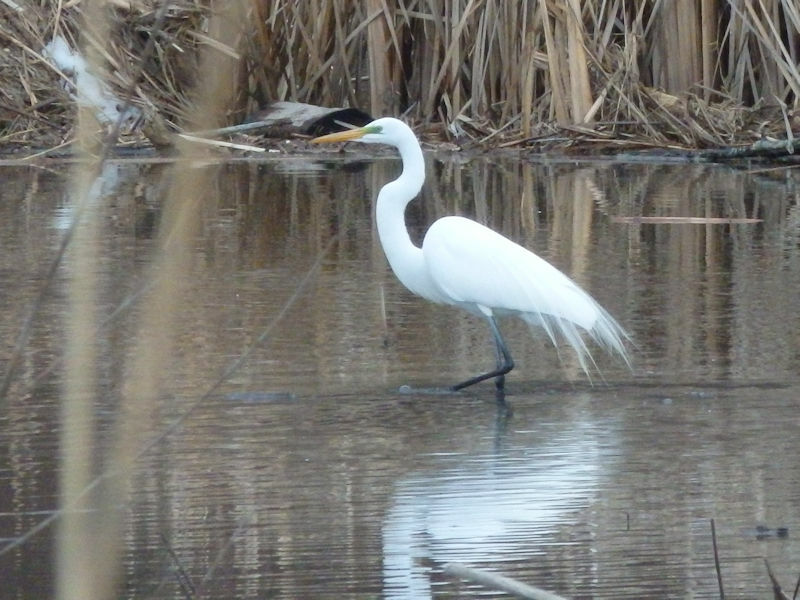 Egret in Bay City State Park. Photo courtesy of Michigan DNR. Click to enlarge. The toxic legacy of Michigan’s 100-year manufacturing past lingers in the Saginaw River and Saginaw Bay. The waterways are the subject of past and present pollution and remediation of dioxins, PCBs, DDT, PBBs, chlordane and heavy metals. The tour will begin with a visit to the Saginaw Bay Visitor Center for an overview of the natural features, history and remediation of one of the largest freshwater wetlands systems in the world. We will continue on the Schooner Appledore with a catered lunch aboard, for a tour afloat of five miles of the river and into the bay, where Channel Island, a confined disposal facility for contaminated dredging spoils, can be seen. Total drive time – 2 hours. The tour is sponsored in part by the Saginaw Bay Watershed Initiative Network. Coverage. Terry Miller, President, Lone Tree Council; Adjunct Professor of History, Delta College; and Board Member, BaySail Inc.
University of Michigan students collaborated with residents of the affected 48217 area to create a mural portraying the impacts of local industry's pollution — and the hope for a better future with clean, breathable air. © Photo courtesy of Detroit Public TV. Watch the 48217 Mural | Detroit Performs Clip. Southwest Detroit has the unfortunate distinction of being the most polluted locale in Michigan. Because the state has no laws regulating the distance between industrial operations and residential areas, a host of heavy industries, including a massive Marathon Petroleum Co. refinery, are clustered in an area where people — mostly African American and poor — are trying to survive. Across town, on Detroit's east side next to a similar residential area, is a controversial facility that burns garbage to produce electricity and steam. Activists have been unsuccessfully trying to shutter it for decades. Along with visiting the areas where the refinery and incinerator are located, the tour also includes a much greener (but still controversial) project that involves the commercial planting of hardwood trees on 1,500 lots previously owned by the city to create what has been described as the world's largest urban farm. Total drive time – 3 hours. Coverage. Rochelle Riley, Columnist, Detroit Free Press and Book Editor/Contributor, "The Burden: African Americans and the Enduring Impact of Slavery"
This tour provides a special opportunity to see the way the automotive industry is being transformed and be a passenger in a self-driving car. We will head to two different laboratories: The American Center for Mobility in Ypsilanti Township, Michigan, the largest test site for self-driving cars in the U.S., and Mcity, a 32-acre mock city with 16 acres of city streets including working traffic lights and stop signs, simulated highway on-ramps and simulated storefronts. We will also tour the EPA's National Vehicle and Fuel Emissions Laboratory, which is responsible for developing the greenhouse gas rules and ensuring compliance with fuel economy regulations. An on-the-record spokesperson will be available to answer questions. Total drive time – 2.5 hours. Coverage. Non-U.S. journalists who wish to go on this tour must submit required information to U.S. EPA by September 19. For details, contact Kevin Beaty, kevinjbeaty@gmail.com. One of the great cities of the Great Lakes, Detroit has a wealth of waterways. Through them, we'll explore how the city is coming to terms with both the industry and austerity of its past. That includes the magnificent renewal of an urban river (which doubles as an international border), debates over public space at Belle Isle, Detroit's 982-square-mile island park (home to the country's oldest aquarium, built 1904), and reckoning with the city's "ghost waters" — long-buried creeks and streams. We'll also look at the complexities of water shut-offs in Detroit, and how urban farmers are experimenting with imaginative green and blue infrastructure. Total drive time – 3 hours. Coverage. Anna Clark, Freelance Journalist and Author, "The Poisoned City: Flint's Water and the American Urban Tragedy"
You've read the stories about a community so disenfranchised that authorities dismissed complaints about brown, smelly water flowing from taps. Now spend time in Flint with people who know it best, residents of this once-thriving auto town where a drinking-water crisis left a community with lead poisoning and other health issues and caused at least a dozen deaths leading to criminal charges against powerful state officials. Learn how Flint is faring now that the national spotlight has dimmed. We'll hear about innovative programs that could influence health infrastructure and regulation in communities near you. We'll also visit with community and business leaders, activists and local residents, to see and hear firsthand about ongoing struggles amid efforts to turn adversity into a model of resilience and hope. Total drive time – 1 hour. Coverage. "In Memoriam: SEJ Mourns the Passing of Flint Resident Jassmine McBride Who Shared Her Story with Us"
The UM-Flint bookstore is on site to sell SEJ members' and speakers' books, as well as offering environmental books handpicked for the SEJ conference. Stop by for book signings from 8:00 - 9:00 p.m.
Now a popular SEJ tradition, this is the conference’s best networking opportunity. After spending the day in the field, meet with hosts of multiple receptions: Bracewell, National Audubon Society, National Parks Conservation Association, SciLine, Sierra Club and World Wildlife Fund. They’ll have experts on hand as well as displays, materials and, of course, great food and drink. And don’t miss the sneak peek at our 2018 exhibitors.